Years ago while helping my younger brother with his English assignment, I stumbled upon a story by Eric Arthur Blair, popularly known as George Orwell. After learning that the interesting fable was part of a larger piece of work, I read Animal Farm, and became a lifetime devotee of Orwell. I loved his allegorical depiction of Russia under Stalin, a perfect example of a great revolution going wrong. Surprisingly, he was born in Motihari, my home district town, approximately 170 Kms north of Patna, the capital of the Indian state of Bihar. 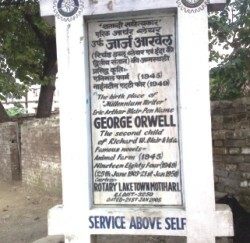 During a very brief visit to Motihari in the mid 90s, all my attempts to know the exact whereabouts of George Orwell's birthplace were futile. The locals, when inquired, either made a blank face or said that they had never heard of a man named George Orwell. “Who is he?” was the casual, almost culpable, remark of a senior local journalist of a respectable national newspaper whom I decided to approach as a last resort. In 2009, when I retuned to Motihari, though on a personal visit, I was determined to visit the birthplace of the great author. On my arrival, I made a telephone call to Sanjay Kumar Thakur, a journalist of a national Hindi daily who was my friend's elder brother, expressing my deep desire to see George Orwell's birthplace. He informed me that he knew people who were championing the cause of the preservation of the site and the construction of a George Orwell memorial. I noted down the address from him and made preparations to travel to the site where Orwell was born in 1903, then part of the province of Bengal. His parents, Richard Walmesley Blair and Ida Blair, had arrived here at the beginning of the 20th century. Blair was a junior civil servant in the department of opium, a sub-deputy opium agent to be exact. The Blairs had been given residence in European quarters on the outskirts of the town, known as Miscourt. At that time it was an administrative centre for the British Indian Government. From Gandhi Chowk, I took the road towards Janpur, and stopped near Delhi Public School where Sanjay Kumar Thakur joined me. We descended from the road to an open field opposite the school, dense with grass and other wild foliage. We started walking on the footpath that diagonally bisected the field. “Walk carefully!” Thakur warned us as the footpath was flanked by turds. I placed a handkerchief on my nose to avoid the strong stench. We finally reached an area where a marble plaque was installed. It read: The birthplace of millennium writer Eric Arthur Blair pen name George Orwell. The second child of Richard W Blair and Ida. Famous Novels: Animal Farm (1945). Nineteen Eighty Four (1949), (25th June 1903-21st Jan 1950). In the background stood an old bungalow where Orwell saw first light of the day. It was a single storied house, now crumbling with cracks on the walls, covered at places by thick hedges. The tiles on the roof were in disarray. The boundary wall appeared to be mended at many places, as there were mismatch between the original bricks and newly constructed wall. The long expanse of open land was being used as a grazing ground; a befitting tribute to the creator of Animal Farm. Opposite the bungalow, there was a dilapidated warehouse with one side of the wall missing and the wild growth and creepers partly covering its walls, where once opium was stored. Two men were sleeping fitfully inside the warehouse, and four teenaged boys were making bamboo baskets. A few years back many Indian and foreign journalists had visited this city, and were surprised by people's ignorance about this great heritage. I tried to meet the English teacher who resides in the same house, in which once the Blairs lived. He was made infamous by a British journalist for his ignorance about George Orwell despite living under the same roof where the author was born. “He is not at home,” a boy standing outside his house informed us. Then I met Prof Iqbal Hussein, a professor of English at the local MS College. “We have ignored our cultural heritage,” lamented Prof Hussein. “Was George Orwell's heritage ignored because he was a white man?” I threw a loaded question. “It is shameful that such an important heritage is being squandered away,” commented Debpriya Bhattacharya, a senior functionary of Local Rotary Club, the person at the forefront of struggle for the construction of a George Orwell memorial. The Club under his leadership was responsible for the installation of a marble plaque at the site so that at least a visitor had something to see. ' But, the state government has to take the initiative as it is a government property.' The Rotary Club is, however, trying to educate people about this aspect of the city’s history by organising seminars, debates and other events every year on the occasion of the death anniversary of this great writer. 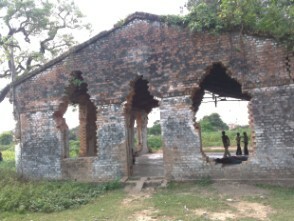 Before leaving Motihari, I was tempted to go to the site one last time. Near the warehouse, I stood looking around for pigs, which had been said to roam around the place, but found none. A dog was luxuriating under the shadow of a tree, and a couple of stray cows wandered around. I stared at the plaque once more before leaving and found myself listening to the good-hearted pig, old Major, giving his famous speech, the animals singing the chorus of 'Beasts of England'. Leaving the place, I took a cycle-rickshaw to the railway station. I didn't have to catch a train but had to withdraw money from the ATM at the station. A long queue of people welcomed me. Taking my place at the end of the queue, I waited at least 40 minutes till my turn came. In the city, the number of ATMs was not commensurate with the number of ATM cardholders. A small time politician along with his sidekicks stood a few yards away with an ATM card in his hand. Dressed in a crisp, immaculately white kurta pyjama, he was short with a broad face and thick moustache. It seemed he was in no mood to stand in a queue and wait for his turn. He walked up to the door of the ATM facility but my hostile stare discouraged him from forcibly entering the cubicle. Minutes later when I was already out of the ATM, his two sidekicks pushed the boy just behind me, making way for the politician. “Bhaiyya Ji will use the ATM first,” they said threateningly. No body protested, not even the guard at the gate of ATM. “Saala!” I heard a few murmurs. A rage welled up inside me, but I too decided to be a mute spectator. A banker from the Indian state of Bihar, Abdullah Khan has written for The Times of India, The Hindustan Times and Brooklyn Rail. He is working on his first novel.